Electronic Mechanisms of Metal Chemical Shifts from Ab Initio Theory, H. Nakatsuji, in Nuclear Magnetic Shielding and Molecular Structure Ed. by J. A. Tossell, NATO ASI Series, C386, Reidel, Dordrecht, 263-278 (1993). Electronic Origin of 95Mo-NMR Chemical Shift in Some Molybdenum Complexes. Relationship between Excitation Energy and Chemical Shift, H. Nakatsuji, M. Sugimoto and S. Saito, Inorg. Chem., 29(17), 3095-3097 (1990). 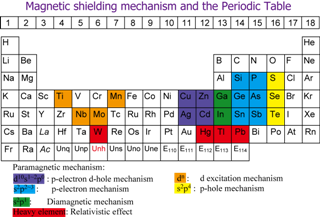 Theoretical Study on Metal NMR Chemical Shifts. Gallium Compounds, M. Sugimoto, M. Kanayama and H. Nakatsuji, J. Phys. Chem., 97(22), 5868-5874 (1993). Spin-Orbit Effect on the Magnetic Shielding Constant Using Ab Initio UHF Method, H. Nakatsuji, H. Takashima, M. Hada, Chem. Phys. Lett., 233, 95-101 (1995). Spin-orbit Effect on the Magnetic Shielding Constant Using the ab initio UHF Method: Tin Tetrahalides, H. Kaneko, M. Hada, T. Nakajima, and H. Nakatsuji, Chem. Phys. Lett., 261, 1-6 (1996). Quasi-Relativistic Theory for the Magnetic Shielding Constant. II. Gauge-Including Atomic Orbitals and Applications to Molecules, R. Fukuda, M. Hada, and H. Nakatsuji, J. Chem. Phys., 118, 1027-1035 (2003). Quasi-Relativistic Theory for the Magnetic Shielding Constant. III. Quasi-Relativistic Second-Order Møller Plesset Perturbation Theory and its Application to Tellurium Compounds, R. Fukuda and H. Nakatsuji, J. Chem. Phys. 123, 044101-1-10 (2005).